It's not John Kerry's fault the world blew up last week. 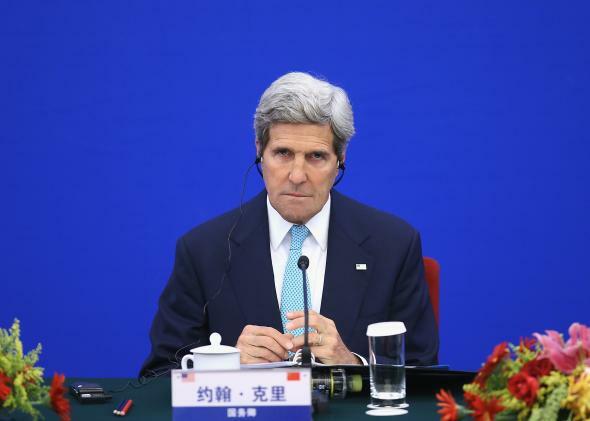 U.S. Secretary of State John Kerry attends a press conference in Beijing, China. on July 10. It was pretty mild as reactions go to the grim civilian death toll from Israel’s bombardment, and I’m guessing pretty mild compared with what U.S. officials say in private, but as Kerry heads to the region in hopes of helping to negotiate a cease-fire, his credibility with the Israeli government is already not particularly high. This is the latest of a number of examples of Kerry going off-script, and it’s leading to the inevitable perception among many that Kerry is bumbling his responsibilities during a week when a number of simultaneous international crises are blowing up. Before host Chris Wallace played back Kerry’s “pinpoint operation,” he had already been pressing the secretary on the administration’s response to the shootdown of MH17 and the stalling of nuclear talks with Iran. There’s plenty of room to criticize the Obama administration’s foreign policy, and Kerry in particular—Syria is a good place to start—but it’s hard to lay responsibility for last week’s grim news at his doorstep. Acting against the conventional wisdom, which held that it was a complete waste of time, it was Kerry who pushed to restart the moribund Middle East peace process in 2013. Ben Birnbaum and Amir Tibon have a riveting tick-tock account of those talks in the New Republic today, which makes it abundantly clear that while Kerry may have been guilty of hubris, it was the parties involved who were responsible for the breakdown. On the other hand, as the authors note, “since the talks collapsed three months ago, Kerry’s warning about a third intifada has looked far more prescient.” Kerry’s efforts may have been futile, but his argument that time was quickly slipping away for a two-state solution is hard to refute. As for Russia, Kerry has been about as tough as America’s chief diplomat can be in his rhetoric condemning Moscow for supporting pro-Russian separatists. The United States has already placed wide-ranging sanctions on Russia and is pushing for Europe to do the same. There’s a tendency to judge U.S. foreign policy on the condition of the world at any given moment rather than the success of actual actions taken. I suspect this is what’s mainly to blame for Hillary Clinton’s slumping approval numbers. But it’s hard to make the case that Kerry’s actions (or lack of actions) contributed significantly to the crises in Ukraine or Israel. And sometimes there is little tangible evidence of a secretary of state’s greatest successes. Consider that there’s a good chance that without Kerry’s intervention, we would also be seeing the outbreak of full-fledged civil war in Afghanistan this week. Unfortunately for Kerry, one of his more impressive feats of diplomacy may have taken place during a week when everyone was distracted by fires no one could have prevented.